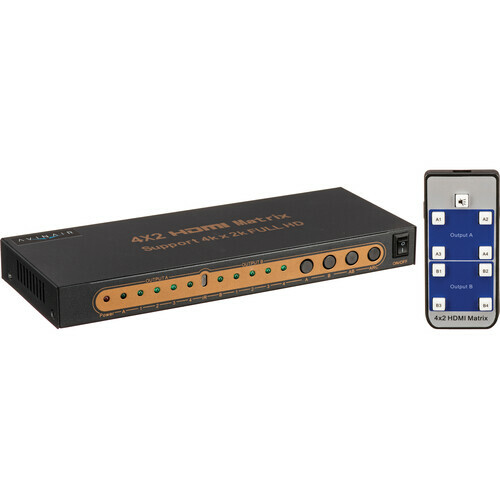 The AVinAir AV-SF-HM402A Spitfire Pro 4 x 2 HDMI Matrix accepts up to 4 ultra HD HDMI input signals, and outputs up to 2 ultra HD video signals simultaneously. Any input can be selected and sent to either output. It supports a maximum resolution of 4096 x 2160 at 24 fps (4K2K) and supports HDMI 1.4. It features a 4 x 2 IR emitter and receiver matrix, with local IR control. Box Dimensions (LxWxH) 8.9 x 7.1 x 2.1"
Can an input be sent to both outputs simultaneously? Dennis is absolutely correct. // Also, if there are any other technical or product related questions, feel free to contact us directly at any time at support@dracobroadcast.com.